A friend of mine is still looking for parts car or separate spare parts for his Reo Royale Limousine (Murrey) from 1931. Hopefully someone out there has some parts to spare: frame, front fenders, gauges etc.. This Royale was formely used by the prime minister of Finland in 1930´s. To what extent parts are exchangeable with other Reo models or different makes? With this knowledge it could be easier to find missing parts. I think the best thing would be to find a parts car. Buying the pieces one at a time will be very expensive. There is one known 8-52 that is an intact car and it is owned by a Reo Club of America member who I think lives in Michigan. You might want to contact him for pictures of his car. 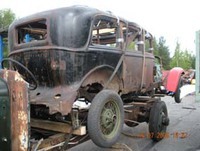 Hi Juha, John is correct, the only way to restore this car is to buy a 8-35 parts car. A few years ago a complete car could be found in the 10-12k range but there are none available that I know of. Here are some pictures from the 8-52 thread. There are photo's on the web site www.edsoldiron.net of the 1932 REO Royale 8-52 here in Michigan. As discussed parts should be interchangeable between most REO Royales 8-31, 8-35 and 8-52. Hope this helps. Thanks for the link Tim. I have updated the 8-52 thread with pictures from the website. Thank you for all the good information and photos. I shall forward them to Mr. Timo Mäkinen - the owner of the Royale body. I shall be following this forum closer from nowon. We are happy to hear about any tips that would help this rebuilding project. 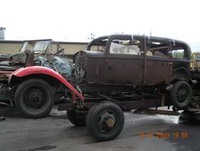 There is one part 1933 Royale for sale in Georgia - just frame, body and axles. Do these parts differ much from the parts used in 1931 models? The 33 has the slanted radiator, and depending on short vs long wheelbase the hoods might not work either. Best to hold out for a 31/32 8-35 sedan as you will simply have to lengthen the chassis and everything else will work including much of the interior. Thank you again for your reply and good information. This is a good learning process for me, too. I would like to learn more about excangeability of parts between different models of Reo automobiles and trucks. That would be good information also for my Model G projects from 1926. Did they use any common parts on Flying Clouds and Royale during years 1931-1932? Not sure on the interchange of parts. Some of the more seasoned REO guys on the forum may be able to help. Juha the best person I know who can help you out is Joe Asuchak in Alberta , Canada . I asked him which Flying Cloud parts would work on the Royale . Joe says the Royale fenders are rolled and the Flying Cloud fenders have beads on the edges . The biggest frame the Flying Cloud had was the 8 - 30 . 8 for cylinders and 30 for 130 inches from centre of axle to centre of axle . You could always cut the frame in the middle and add 22 inches to it ? Thank you for this reply also. I guess I have to write a letter to Joe since he seems not to have email. Joe could also be best person go get some measurements of frame, doors etc. Has anybody patterns for body woods or has somebody made some extra pieces of them? Thank you for this reply. I think there must have been some Royales in Europe. Hope to find more information about them. It was sad that this beautiful Reo did not survive.